1 Marlborough is located on the north side of Marlborough, between Arlington and Berkeley, with 6 Arlington (0 Marlborough) to the east and 3 Marlborough to the west. 1 Marlborough was built in 1862-1863 by Samuel Shurtleff Perkins, a carpenter and builder, probably for speculative sale. Samuel Perkins purchased the land for the house on April 10, 1862, from Peleg W. Chandler, J. Amory Davis, and Henry Lee, Jr. It was part of a larger tract of land they had purchased on September 2, 1858, from George Goss and Norman Carmine Munson, who had purchased the land from the Commonwealth of Massachusetts that same day. George Goss and Norman Munson were the contractors responsible for filling the Commonwealth’s Back Bay lands. Click here for an index to the deeds for 1 Marlborough. On March 10, 1863, the “new brick dwelling house” at 1 Marlborough was purchased from Samuel S. Perkins by Robert Sedgwick Watson, treasurer of the fiscal agency of the Hannibal and St. Joseph Railroad of Missouri. He and his wife, Mary Taber (Hathaway) Watson, lived in Milton. On April 11, 1863, 1 Marlborough was purchased from Robert Watson by Katharine Cottrell (Glidden) Glidden, the wife of William Taylor Glidden. They previously had lived in the Longwood neighborhood of Brookline. William Glidden was a master mariner and partner in the shipping firm of Glidden & Williams, a major owner of clipper ships operating between Boston and San Francisco. The Gliddens maintained their primary residence in Newcastle, Maine, at his family home, Gladisfen, and spent winters at 1 Marlborough. Living with the Gliddens were Susan C. Glidden, William Glidden’s daughter by his first marriage to Susan (Cotter) Glidden, and his three surviving children by his marriage to Katherine: Emma Fields Glidden, John Murray Glidden, and Mary S. Glidden. Emma Glidden married in May of 1864 to Charles Perkins Gardiner, a lawyer. After their marriage, they lived in Brookline. Susan Glidden married in October of 1865 to George William Webster Dove, a chemical manufacturer. After their marriage, they lived in Andover. John Murray Glidden. a partner in his father’s shipping firm, married in October of 1869 to Anna Maria Warren. After their marriage, they moved temporarily to 230 Beacon. By 1871, they were living with his parents at 1 Marlborough (their daughter, Mary Warren Glidden, was born there in May of 1871), but then moved soon thereafter back to 230 Beacon. Katharine Glidden died in January of 1890. 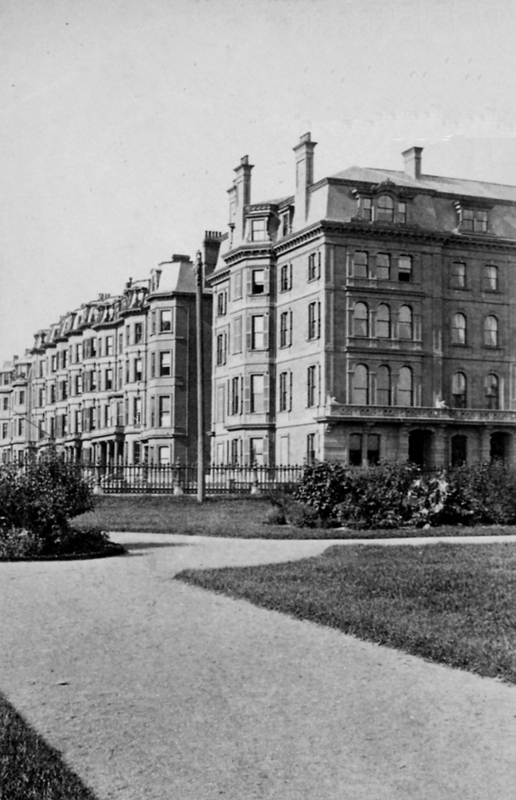 William Glidden continued to live at 1 Marlborough until his death in January of 1893. On March 30, 1893, 1 Marlborough was purchased from Katharine Glidden’s estate by Dr. Arthur Tracy Cabot, a surgeon specializing in urology. He and his wife, Susan (Shattuck) Cabot, lived next door, at 3 Marlborough, and acquired 1 Marlborough to serve as his medical office. Dr. Cabot also rented lodgings and office space at 1 Marlborough to other physicians. Dr. Franklin Greene Balch lived and maintained his medical office there from about 1894. He previously had lived in Jamaica Plain. He married in November of 1894 to Lucy Rockwell Bowditch. 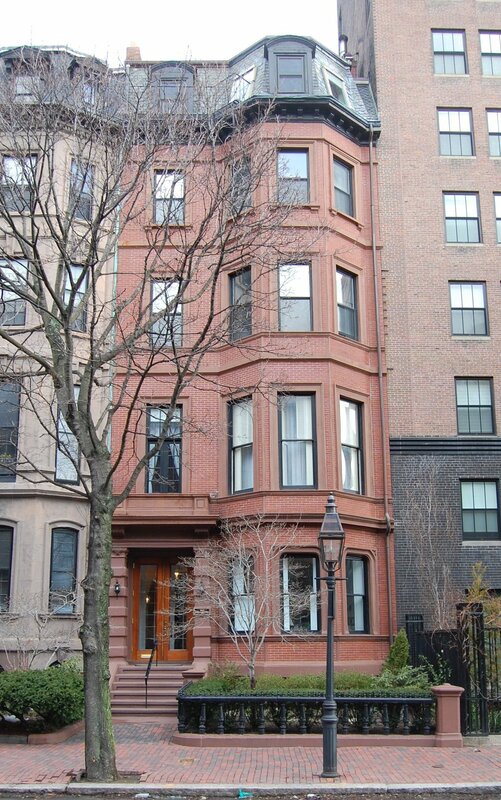 After their marriage they moved to an apartment at 261 Beacon and then, in 1896, purchased and moved to 279 Clarendon. He continued to maintain his office at 1 Marlborough until about 1899. Dr. Charles Locke Scudder also lived and maintained his medical office at 1 Marlborough from about 1894. He previously had lived and maintained his office at 94 Charles. In March of 1895, he purchased 189 Beacon to be his home and office, probably in anticipation of his marriage in September of 1895 to Abigail Taylor Seelye. In about 1900, Arthur Cabot’s first cousin, Dr. Hugh Cabot, who had graduated from Harvard Medical School in 1898, joined his practice. Arthur Cabot’s father, Samuel Cabot, and Hugh Cabot’s father, James Elliot Cabot, were brothers. Hugh Cabot lived at 1 Marlborough from about 1900 until his marriage in September of 1902 to Mary Anderson Boit, after which they moved to 5 Marlborough. Arthur Cabot died in November of 1912. On October 2, 1912, shortly before his death, Arthur Cabot sold 1 Marlborough to his first cousin (Hugh Cabot’s brother), Dr. Richard Clarke Cabot. He and his wife, Ella (Lyman) Cabot, made it their home. They previously had lived at 190 Marlborough. Richard Cabot was a physician and professor of social ethics at Harvard University, and established the Social Service Department at Massachusetts General Hospital. Ella (Lyman) Cabot was an was an educator, author, and lecturer. On October 8, 1912, Richard Cabot transferred 1 Marlborough to his father-in-law, Arthur Theodore Lyman. Arthur Lyman died in October of 1915, and on May 19, 1917, his estate transferred 1 Marlborough to Ella (Lyman) Cabot. Richard and Ella Cabot continued to live there until about 1923, when they moved to Cambridge. They continued to own 1 Marlborough and lease it to others. By the 1922-1923 winter season, 1 Marlborough was the home of Joseph T. Brown, Jr., and his wife, Irene Thacher (Jenney) Brown. They previously had lived at 254 Beacon. Joseph Brown was a druggist in his father’s firm and later trustee of his father’s estate. Living with them were their unmarried adult children, Martha Thacher Brown and Joseph Frank Brown. Joseph Frank Brown was a real estate and insurance broker. 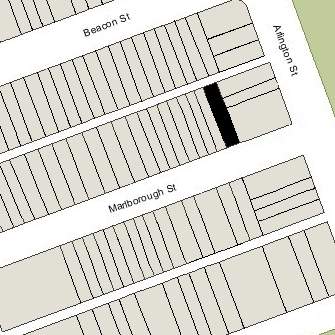 The Browns continued to lived at 1 Marlborough in 1927, but moved soon thereafter to 114 Marlborough. On January 30, 1928, 1 Marlborough was purchased from Ella Cabot by real estate dealer Ray C. Johnson. He transferred the property to Claire Carlin on February 1, 1928, and she transferred the property to Mary Quirck on February 13, 1928. On February 15, 1928, 1 Marlborough was purchased by the Charlotte Cushman Club of Boston. The Charlotte Cushman Club (named after a well-known 19th Century actress) was founded in 1927 by Janet (Allison) French, the wife of Malcolm Bradley French. Modeled on the club of the same name in Philadelphia, founded in 1907, it provided safe and inexpensive lodgings for traveling actresses. It formally opened at 1 Marlborough in May of 1928 and continued to be located there until the early 1940s, when it purchased and moved to 86 Beacon. On August 14, 1942, 1 Marlborough was acquired from the Charlotte Cushman Club by Charles R. Lynde. Janet French remained president of the club at the time of the sale. On September 15, 1942, 1 Marlborough was acquired from Charles Lynde by John S. Lennerton and Curtis Guild Metzler. John Lennerton was treasurer and manager of Reliance Motor Transportation, Inc., in Cambridge and lived in Melrose. Curtis Metzler was a lawyer. He lived in Brookline, but moved to 1 Marlborough after they acquired it. John Lennerton and Curtis Metzler converted 1 Marlborough into the Marlborough Service Club, designed to provide reading rooms, libraries, and social facilities for Army and Navy officers, trainees, and their wives. On January 28, 1943, they transferred the property to the club. On June 15, 1944, 1 Marlborough was acquired from the Marlborough Service Club by Mabel Anne (Cowie) Adams Doyle, the widow of Dr. William Gray Adams, a physician, and the former wife of Henry Lawrence Doyle. She used the surname Adams even though she had been married a second time to Henry Doyle. She lived at 16 Commonwealth, where she operated a lodging house. On October 27, 1944, 1 Marlborough was acquired from Mabel C. Adams by Nels Spongberg. He and his wife, Elin (Villander) Spongberg, lived at 111 Commonwealth, where they operated a lodging house. On the same day, 1 Marlborough was acquired from Nels Spongberg by Ida M. (Lundvall) Anderson, the wife of Carl M. Anderson. They lived at 22 Worcester Square and operated 1 Marlborough as a lodging house. In February of 1946, she filed for (and subsequently received) permission to convert the house from a club into a lodging house, legalizing the current use after making safety and egress improvements. She and her husband subsequently made it their home. Carl Anderson died in July of 1951. Ida Anderson continued to live at 1 Marlborough and operate it as a lodging house until about 1955. On October 3, 1955, 1 Marlborough was acquired from Ida Anderson by Barnett Feldstein and his wife, Edith (Martin) Feldstein. He was treasurer of the General Textile Company; they lived in Dorchester. They operated 1 Marlborough as a lodging house. The property subsequently changed hands, remaining a lodging house. On July 28, 1978, 1 Marlborough was acquired by Ann Steinhardt, Mary B. Davenport; and P. Enoch Stiff, On September 18, 1978, they transferred the property to the Marlborough Street Associates LP, formed by P. Enoch Stiff and his wife, Ruth Stiff. In September of 1978, Marlborough Street Associates filed for (and subsequently received) permission to remodel the house and convert it from a lodging house into six apartments. In November of 1978, it amended the application to add construction of a partial sixth floor, comprising a penthouse occupying about one-third of the roof area, in the rear of the building. On June 21, 1978, Marlborough Street Associates converted the apartments into five condominiums, the One Marlborough Condominium.